The fishers have laid out their catches and are selling them to the locals walking the Steveston docks on a Saturday morning. Many kinds of fish and seafood, including crab, prawns and halibut, are on display, along with the boats that crowd Fishermanâ€™s Wharf. This has been a source of income for seamen since Steveston was first founded as a fish- ing village in 1890. There is a smalltown feeling to it all. Turn around though, and you might get a different feeling. The other side of the wharf is loaded with restaurants and shops for the tourists. Walk a block to the east and you see three coffee houses â€” Blenz, Starbucks and Waves â€” all within one glance. A block north, thereâ€™s a McDonaldâ€™s nestled into the old train-station building across from Steveston Park and Community Centre. With more commercial development moving into the Richmond subdivision, there are those who think the sense of community in Steveston is getting lost. Given that itâ€™s one of Richmondâ€™s first neighbourhoods, some feel that the â€œgrittyâ€ feel of Steveston should be a priority. too much. 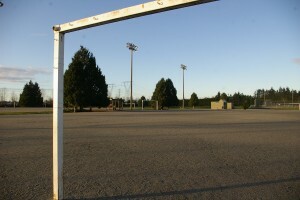 The way itâ€™s being built is taking away from the overall appearance of Steveston,â€ Scott said. â€œThere were lots of older buildings that were one storey and and now there are two-storey buildings with the apartment above. Itâ€™s becoming bigger than it should,â€ added Scott, who has worked at Daveâ€™s for 17 years. Daveâ€™s has been in Steveston since 1978 and although itâ€™s moved a couple of times, business has been pretty solid, even after McDonaldâ€™s opened just down the road. Scott said that McDonaldâ€™s moved in at a time when a lot of apartments were being built and more people started to live in Steveston. Development might not be that bad, said Terry Crowe, manager of the Policy Planning Division for the City of Richmond and member of the Richmond Heritage Commission. 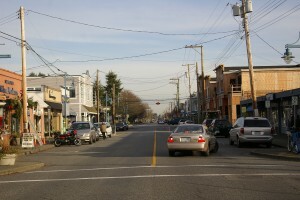 Crowe said that of the 90 buildings in Steveston Village, only 17 are protected by the Steveston Area Plan, a heritage-conservation strategy. The other 73 buildings can be demolished or changed in any way. The 17 protected buildings cannot be knocked down and the exteriors must comply with the 14 federal heritage standards set by Parks Canada. Conserve the heritage value of a historic place. Do not remove, replace or substantially alter its intact or repairable character-defining elements. Do not move a part of a historic place if its current location is a character-defining element. Conserve changes to a historic place which, over time, have become character-defining elements in their own right. Find a use for a historic place that requires minimal or no change to its character-defining elements. The exteriors of the buildings must stay the same, but the interiors can be altered. â€œWeâ€™re just interested in the exteriors of the buildings. We donâ€™t care what is done with the insides, so that gives the village a lot of flexibility,â€ Crowe said. Daveâ€™s Fish and Chips is one of the protected buildings. The structure itself is made up of brick and wood with two bright-blue doors and big bay windows facing Moncton Street. On the east side of the building, thereâ€™s a take-out section and some picnic benches. Another one of the 17 heritage buildings is the post office/museum, which looks like an old house sitting on the corner of Moncton and First Streets. It was Stevestonâ€™s first bank, built in 1905. The top half of the building is painted burnt orange, the bottom is a creamy yellow. The house exterior is accented by thick, white trim. There is a park in the back that is shaded by leafy trees in the summer. The outside of the building has been preserved to match the federal heritage standards, but the inside is a functioning post office and museum dedicated to Stevestonâ€™s history. Crowe also explained that some of the 73 buildings not protected by the Steveston Area Plan are privately owned, so the City of Richmond cannot decide what businesses can move into that space. Crowe said he feels that as long as the Steveston Area Plan and federal heritage standards are followed, the new commercial development doesnâ€™t affect the small-town feel of Steveston at all. He said that people want someplace to live, work and play in a community and because of that, both commercial development and heritage buildings can co-exist in Steveston. Thereâ€™s an old stereotype of the family: Mom stays home with the kids while dad goes off to work to support his wife and children. That stereotype doesnâ€™t necessarily apply anymore. More dads are staying home while moms are the family breadwinners, says Kwantlen sociology instructor Seema Ahluwalia. Those are fathers like Chad Skelton, reporter for the Vancouver Sun and current stay-at-home father. Heâ€™s in the middle of an unpaid leave of absence from his job to stay home with his 18-month-old son. Skelton, 33, has been home with his son since March and although he loves it, his role at home still isnâ€™t understood by some older men. the aquarium or the park on nice days. And his son has two naps a day, giving Skelton some time to work on the weekly parenting column that he writes for the Sun or to mark papers from the class he teaches one night a week. Not all men take to stay-at-home parenting like Skelton does, though. Ahluwalia, who has been teaching for 10 years, finds the worries of a stay-at-home dad not being a â€œreal manâ€ common. â€œWe hear a lot from stay-at-home dads about the stereotype of not being treated like a real man because theyâ€™re not getting a real job,â€ she said. Ahluwalia said that after 40 years of cultural changes, before which a father as the stay-at-home parent was â€œutterly inconceivable,â€ roles have changed into more of a whocan-actually-do-it-right-now style of parenting. â€œWith the economy becoming more and more expensive over the years, that has forced the ways of parenting to change. Sometimes, the woman has a better job and, for that family, it might be a better solution with the dad staying home,â€ said Ahluawalia. Her husband, a ceremonial leader in his Lakota First Nation, takes their seven-year-old son around to all his lessons, which include piano, horseback riding and art. â€œMy husband and I see ourselves less as teachers and more like facilitators. Our son wouldnâ€™t be able to have the schooling experience heâ€™s having if my husband didnâ€™t stay at home,â€ she said. Statistics show that stay-at-home dads are becoming more common in Canada. â€œIn 1976, there were 36,000, whereas now, there are 77,000,â€ said Ahluwalia. With more women getting into the workforce, she said, itâ€™s not as easy for a man to graduate from school, get the ideal job and live the stereotype. In this photo illustration, Milana Jasper (left) and Heather Tijman are demonstrating one method of preventing the spread of the H1N1 virus by wearing a mask when being cared for. How far would you go to avoid getting the H1N1 virus, more commonly known as swine flu? Some countries have been taking extreme measures against the virus, but local health authorities say that’s not necessary. â€¢ In April, Egypt ordered the slaughter of the country’s 300,000 pigs, believing it would calm people because pigs are seen as unclean, reported the Sydney Morning Herald. â€¢ The majority of the Japanese public has worn masks since May to avoid the H1N1 virus, thousands of schools were closed and testing centres were flood with people, reported Foreign Policy magazine. Also, Japanese politicians have announced that they will not shake hands with anyone until the H1N1 scare has died down. â€¢ The Big Gig Weekend festival at the Royal Bath and West Showground in Britain has taken out insurance of up to one million pounds for performers Katherine Jenkins, James Morrison, Boyzone and Diversity, in case they come down with the virus, reported the London Telegraph. â€¢ According to l’Agence France-Presse (AFP), when a case of H1N1 was confirmed in a passenger coming from Mexico, Hong Kong quarantined the hotel where the traveller was staying, and tired to track down all the passengers who were on the plane with the man. â€¢ China was prepared to close schools and convert a holiday camp into a quarantine centre when the virus hit the country, reported AFP. â€¢ The Local (Sweden) reported that some Swedish churches have started serving fortified wine at communion, hoping that it will reduce the risk of the spread of H1N1, while others have advised Swedish faithful not to attend communion. 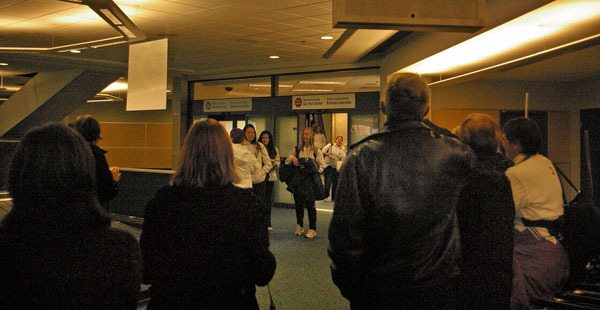 But all the action that needs to be taken is being prepared, said Roland Guasparini, the Chief Medical Officer at the Fraser Health Institute. â€œIâ€™ve heard of people avoiding air travel and keeping kids out of their activities, but thereâ€™s no need to do anything much more than that,â€ said Guasparini. â€œWhat you need to do is stay healthy, sleep, eat well, get some exercise and keep away from sickies. Though itâ€™s a bit of an odd idea, Guasparini said that the Japanese politicians may be on to something by not shaking anyoneâ€™s hand. He said that if you shake hands with somone with the virus, and then eat something without washing your hands, you could get the virus. Guasparini thinks that the ru- mour of how H1N1 is contracted â€“ humans getting it from pigs â€“ has been put to rest because of media coverage. He said that itâ€™s actually the other way around: humans give H1N1 to pigs or to other humans. 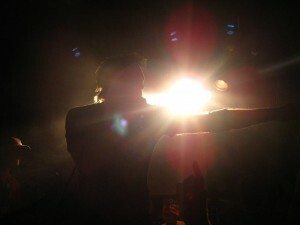 Venice Queen lead singer Ryan Bloomfield rocks out at one of their shows downtown. Everybody loves to see their favourite stars perform, but nobody likes the empty wallet when the show is over. For example, tickets to the Oct. 23 Rascal Flatts concert cost at least $85 for a decent seat, which for some is too much for four hours of music. A way to remedy that is to see the talent showcased a couple nights a month at Richmond community centres, for $5 or less. Youth programs at both Steveston Community Centre (SCC) and South Arm Community Centre (SACC) run the band nights on Fridays during the Night Shift program, a weekly youth hangout night and now Cambie Community Centre is getting in on the act. The Cambie centre, at the corner of Cambie and Jacombs roads in	Richmond, is hosting Richmond based band Venice Queen’s first all-ages show on Oct. 23. Opening for them will be local youth bands Ill and Fallen, and The Chase. All three up-and-coming bands play serious rock music, and the Cambie Night Shift coordinator is excited that they’re playing at the community centre’s first ever band night. Venice Queen is one of the winners of the 2009 Vancouver Seeds competition, held by The Fox radio station for indie bands. The band has also played a number of shows downtown, but wanted to become better known in its hometown, so agreed to headline Cambie’s band night, which has a $5 cover charge. Venice Queen has also played at	South Arm Community Centre, which, along with Steveston Community Centre, has regular shows featuring high-school-aged and young adult bands. Alvin Li, a Steveston Community Centre youth development worker, said that the band nights are more about the kids and their music than making money..
SCC presents five or six acts a night, consisting of acoustic music with some rock and alternative thrown in. Li said they also want to expand into hip hop. Most of the youth-oriented events at Steveston, including band nights, are “run by youth for youth,” said Li. He also said it’s a chance for SWAT, Steveston with Active Teens program, to learn how to organize events and members to develop leadership qualities. Band nights at South Arm Community Centre are also run mainly by its youth group, Mosaic, and organized with the help of Andy Roy, a youth worker. SACC has a band night once a month, featuring three or four local bands who play some metal, screamo, rock and alternative music, with a $5 cover charge. The next show at SACC is Nov. 13; the bands haven’t been announced yet. The Kwantlen Eagles women’s soccer team arrived home Sunday from the Canadian Collegesâ€™ Athletic Association National tournament in Toronto, with bronze medals around their necks. Along with the bronze, they hold the title of being Kwantlen’s first-ever team to win a national medal. Starting goaltender Amelia Ng, who was earlier named MVP at the provincial tournament that sent the Eagles to the nationals, was proud of the way her team turned things around after starting their season 1-4. Coach Vladimir Samozvanov was equally as proud of his team. “I didn’t change anything from the beginning of the season. I knew the girls could play better, I had confidence [in them]. Luckily, things turned out well. It felt great to accomplish what we did,” he said. Kwantlen’s only loss in the national tournament was to the eventual national champs, Concordia University College of Alberta. The Eagles had a slow start to their season, losing four of their first five games, but finished strong with two big wins over Thompson Rivers University, their first ever, and UBC-Okanagan, a team who beat them in September, 2-1. Those wins propelled them to a berth in the Provincial tournament. The Eagles charged through the B.C’s, winning gold, and moved on to the national championships. 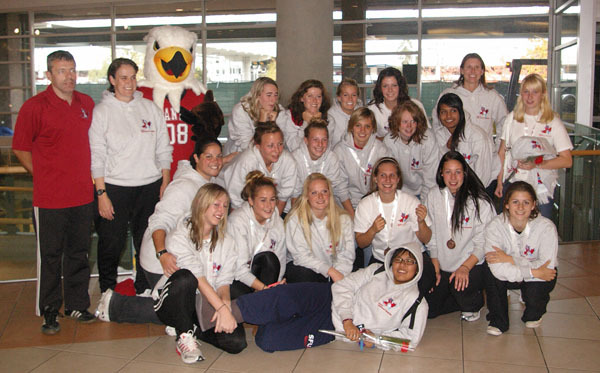 The 2009 National Champion Kwantlen Eagles are: Amelia Ng, Rosemary Kelly, Samantha Lewis, Tara Makrigiannis, Marissa Dionne, Meghan Springford, Colette Coulter, Jaqueline Rempel, Brittany McNeill, Shanay Sangha, Christine Walker, Courtney McCulloch, Christina Henderson, Jacqueline Buchler, Taylor Sarchet, Kelsey Doherty, Thoralea Pilton, Sarah Davies and Meghan Nilsson. Coaches are: Vladimir Samozvanov, Joan McEachern and Kim Bull. 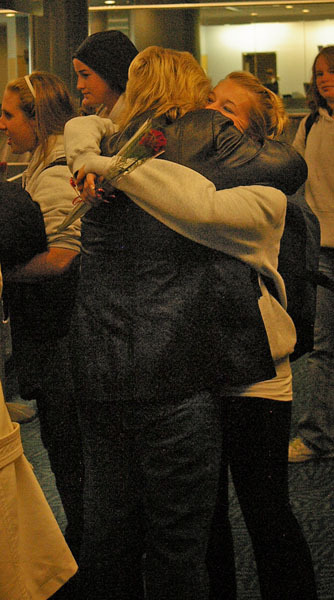 As UBCO huddled and cheered, the Eagles stood on the floor, dumbstruck, unable to believe what had just happened. The Kwantlen Eagles men’s basketball team fought hard Saturday night against the UBC-Okanagan (UBCO) Heat, but lost 65-63 when UBCO’s Alex Roth scored a buzzer-beating lay-up. The teams were evenly matched, as they swapped leads throughout the game, and the Eagles led by one at the half. But after half time, it’s as if a different team had come out on the floor. 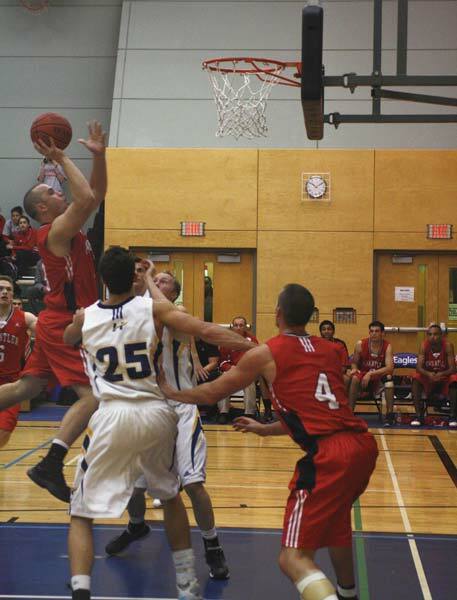 Kwantlen’s field goal shooting stalled in the third quarter and missed foul shots began to add up. Down by double-digits late in the fourth, Kwantlen’s Dustin Egelstad led Kwantlen to within three points of the Heat and Varinder Singh tied the game with three foul shots after being fouled beyond the arc. With seconds left, UBCO threw up a shot that hit the rim just as the shot clock hit zero. Kwantlen thought that the game was headed to overtime, but Roth grabbed the rebound and laid the ball in to win the game for the Heat. The loss means Kwantlen starts its season off 0-2. The team’s next game, the start of a long stretch of away games, is in Victoria against the Camosun Chargers on Nov. 13. The Eagles’ next home game is Jan. 29, 2010, against the Vancouver Island University Mariners. 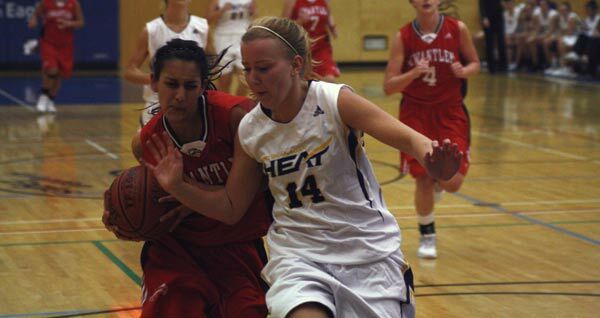 Despite a strong effort, the Kwantlen women’s basketball team dropped their second game in two nights to the UBC-Okanagan (UBCO) Heat 60-52 Saturday. UBCO scored the first basket of the game, but after that, Kwantlen didn’t fall behind until the fourth quarter, when UBCO came storming back and took control of the game. Both teams had an aggressive outing, but early on, everything went Kwantlen’s way. The Eagles led by as many as eight at one point, and when the two teams were tied in the first half, UBCO couldn’t get a single basket to fall. At half-time, the score was 29-28, but the Eagles had control of the game. Kwantlen’s Jessica Williams and Emily Wright drove the tempo in the first half, each scoring seven points, and fourth-year veteran Taminder Dhaliwal had six. Kwantlen’s dominance continued through the third, but when the fourth quarter started, a couple of baskets by the Heat shifted the momentum. 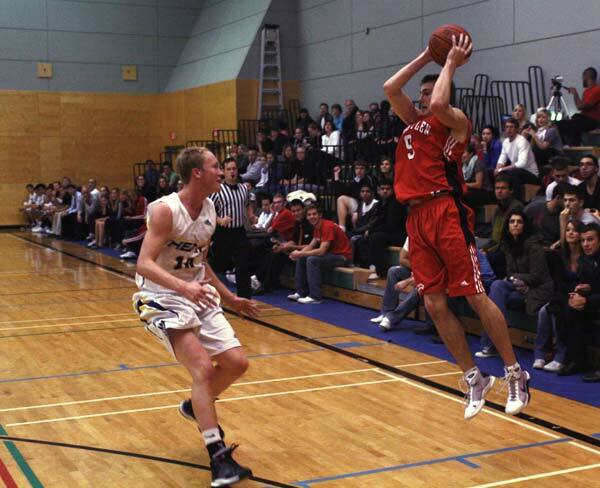 UBCO scored 19 points in the fourth, compared to Kwantlen’s eight. Jenna Kantz and Audrey Siebert-Timmer were the Heat’s top scorers in the game, scoring 11 and 10 points. Although Kwantlen didn’t come away with a win, Eagles coach Gary Pawluk had a positive view of the game. Pawluk said that when Kwantlen is shooting well, they are tough to match and that will be one of the team’s strengths this season. “Basketball is all about rhthym and when you get in rhythm, you become a very good shooter. It’s tougher to get in rhythm in games. That’s the challenge we face,” he said. Kwantlen’s next game is Friday, Nov. 13, the first of two games that weekend, in Victoria against the Camosun Chargers. The Eagles don’t play at home again until Jan. 29, 2010. The Kwantlen Criminology department will host the award-winning film, Warrior Boyz, at the Surrey Campus on Nov. 3. The film, which is about gang violence and is set in a Surrey high school, was one of 10 winners of a $1 million grant from the Social Sciences and Human Research Council – Community University Research Alliance. The prize money will go towards Acting Together, a project looking to prevent youth from getting involved in gangs. Warrior Boyz was brought to Kwantlen’s attention by Joan Nesbitt, who’s been part of the Criminology department for 14 years. Nesbitt originally wanted to show the film to her class, but when she contacted the director of the film, Beljit Sanghra, the simple showing snowballed into a larger, public screening that is meant to be seen as a community event. “We’ve decided to really open it up to not only the Kwantlen community, but the larger community as well. I think that’s one of the defining features of this event, is we really want this to be seen as a community event and we really want to have a dialogue with the community about gang violence,” said Nesbitt. She feels that gang violence is a community issue and that many Kwantlen students are involved, peripherally or not, with gangs and it’s not only a good idea to open up talk about gang violence to students, but the community of Surrey and even the Lower Mainland. Dr. Gira Bhatt, a psychology instructor at Kwantlen and Acting Together project director, feels just as strongly as Nesbitt does about the issue of youth involved with gang violence. “The idea of this event is to create awareness and make everyone think about what we can do to help kids involved in the gang life and bring everyone together,” Bhatt said. The Criminology department has no other current plans of getting involved with the prevention of youth in gang violence, but if this event goes well, Nesbitt said that might change.